Questing is the best way to get yourself acquainted with your realm's lore. Through quests you will learn the history behind the warring realms, while advancing your player character. To find the quests available for your level, you can easily do it by using the Map (which can be opened by pressing "M") and ticking the "Quests" option in the top of the window. Those icons will indicate the location of an NPC (Non-Player Character) with a quest for you. You'll also be able to see them in the Mini Map at the top right of the screen. To find a Subclass Quests, you will need to talk to your trainer once you have chosen a subclass. This character will have quests for you as well as be able to point you in the direction of more quests. Some quests may require multiple players to complete. To find Shadow Quests and epic quests you will need to thoroughly explore each town and its surroundings. You can find character-building and Subclass Quests by looking for NPCs with a yellow admiration mark (!) on their heads. When you speak to a NPC a window of topics that the NPC can discuss will appear. If there are any available quests, a "Quests" button will be displayed. Pressing it will show a list of available quests. If you want to take on any of them you just need to press the corresponding "Accept" button. You can always accept the quest later on if you wish to. Once you have accepted the quest, it will be listed in your Quest Window. The Quest Window can be accessed by clicking on the goblet icon on the bottom right of your action bar. You will see all your active quests and your current task for each quest listed in the following window. 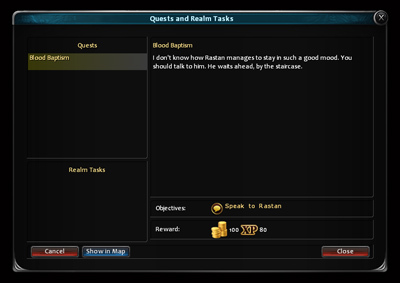 It also shows Realm Tasks, which are described in the bottom of this help section. Cancelling a quest at any point will forgo any part of the reward for completing the quest, even if you have completed some of the tasks required to complete the whole quest. Reward for a quest comes only when completing each and every task and talking to the NPC at the end of it. Cancelling a quest will return the quest to the NPC that offered the quest in the first place and will allow you to re-accept the quest at a later time. Note: Many NPCs offer more than one quest but may require you to complete the current quests being offered before offering the next quest. If you are tasked to kill a set amount of a certain creature you will find completion status information will pop up every time you kill one of those creatures. If you are tasked with multiple objectives in a quest you will find the objectives listed in the right side of the Quest Window for that selected quest. This will help you track its status. If you are tasked with talking to or interacting with another NPC you will find your target NPC with a yellow question mark (?) above their head. Also, the next objective of the quest will appear in the right side of the screen for it to be acknowledged easier without having to open the quest window. Once you have completed all objectives of an Active Quest you will return to a NPC for reward. This NPC may not be the same as the NPC that gave you the quest. 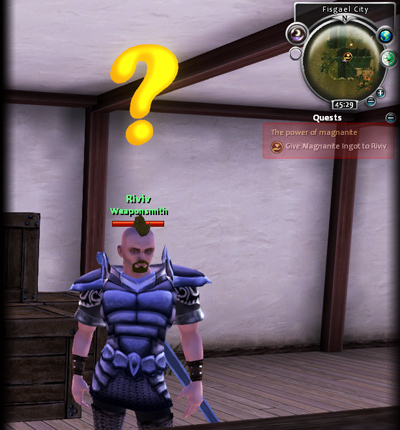 The name of the NPC will be listed in the Quest Window for reference and upon finding the NPC they will be highlighted by a yellow question mark (?) above their head. Interacting with this final NPC will give you your reward and complete the quest. Providing an engaging way to get experience and other rewards, Realm Tasks allows players to level up while helping their realm. They can be about running some errand or killing enemies. You can get them by clicking in the Realm Task posts near the entrance of the main cities. 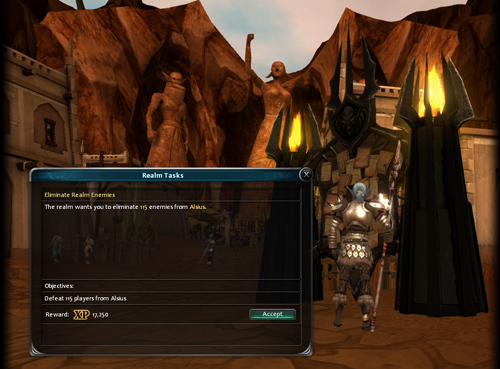 As explained before, assigned Realm Tasks can be seen in the Quests window, accessed through the goblet icon button. 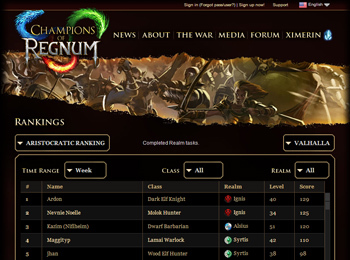 Realm tasking in CoR adds some light competition to PvE by tracking all completed Realm Tasks displaying the results of the Aristocratic Ranking on the Ranking page of the web site.